RogueStudio has had its interest in indie game development for quite some time – for fun, for good times and enjoyment- check out some of the previous projects below! Android/iOS, 2013. Have a merry old joust with Brightly Coloured and Sparkly Unicorns! This project came out of QUILTBAG JAM 2013 at MIT with a great team! Available iOS and Android, more information is available over here as well! PC, 2013. 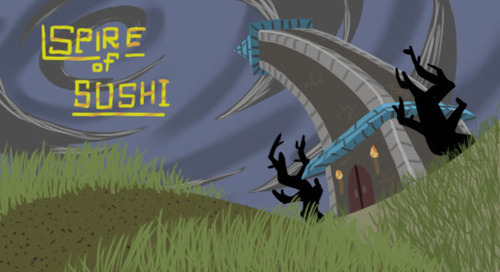 A party of disgruntled workers from displeasing occupations decide to enter the Spire of Sushi, where victory or death by Sushi-riffic monsters awaits? Will you survive? Post Mortem and Download to the game can be found on my blog! Produced with Dan Silvers of Lantana Games and Will Brierly of Snowrunner Games for Ludum Dare 26- Rockets shooting potatoes while avoiding dogs and bees? No, it’s not supposed to make sense, it was based upon LD’s theme of “minimal” and an inside joke, mostly. Postmortem and game is at Ludum Dare’s site! iOS, Android, and Nook. Produced during Global Game Jam 2013. Can you escape the mansion before the monster gets you?